Our most popular hire item! These 3 foot LOVE letters are a fab focal-point for your venue and a perfect photo opportunity. The letters can either be leaned up against a wall as shown in the photo above or attached to our sturdy wooden bases to make them freestanding. The bases make the letters very sturdy and safe so that they will not fall over. Choose between battery powered (batteries included) or mains powered lights. Main lights are PAT tested. The lights can be flashing or static. You can switch between light styles easily during the day if you wish to change them. The battery powered lights are the best option in our opinion as it means you can place the letters wherever you want in your venue without having to be near a power socket. It also means each letter is wired separately so you can vary the distance between each letter and you don’t have trailing wires going between them. We’ll deliver the LOVE letters to your venue and set them up for you. We’ll then collect them when your event has finished – either that evening or early the next morning. Define the Day are Swindon based but will travel to your event. Delivery is free within 10 miles of our Swindon (SN3) base. A small delivery charge applies for distances further than this. We will travel up to an hour’s drive from Swindon. 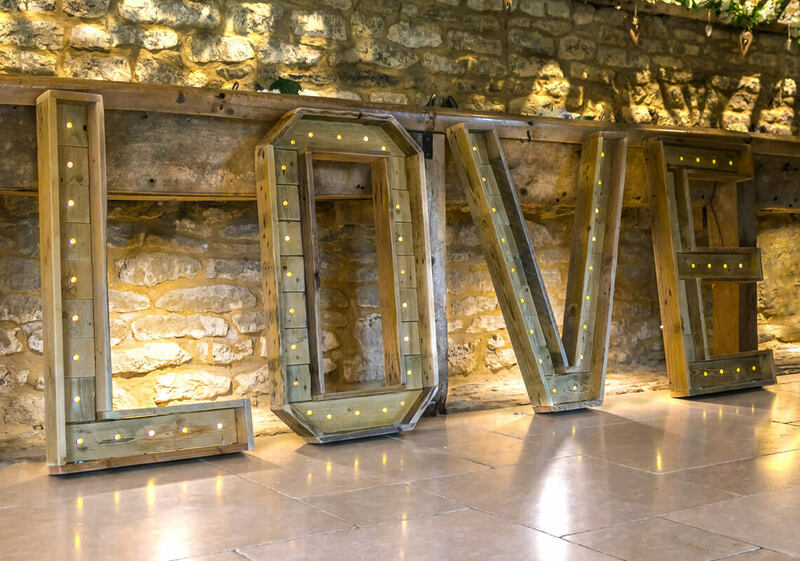 If you book us for your wedding video then you can hire these rustic LOVE letters for only £70 – that’s a saving of £25!